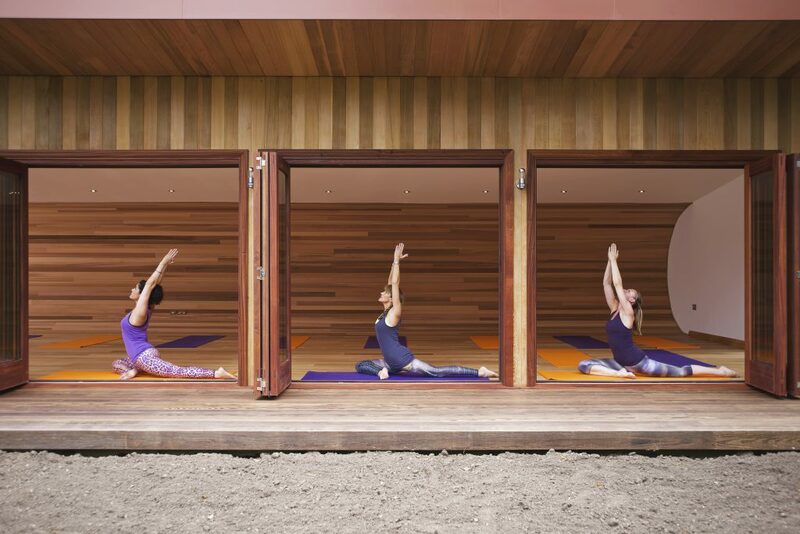 Blue Forest’s Yoga Studio is the perfect setting to feel at one with the world. The studio was commissioned by Sp8ce Yoga to provide a stunning and peaceful environment for the client to host yoga classes just across the garden from her house. This tranquil studio has everything an experienced yoga practitioner, or the yoga curious, could want. 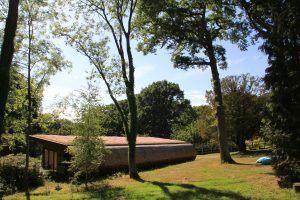 The studio’s design is based on an elongated cuboid with a dramatic curved face along the rear elevation. This shape both echoes and plays upon the organic shapes already present in the garden to give a striking aesthetic that despite its size, remains entirely at peace with its surroundings. 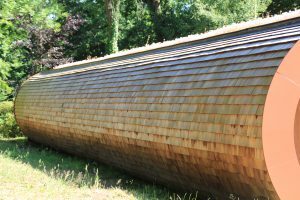 A combination of premium grade cedar shingles and cedar tongue and groove lining finish the building’s exterior. 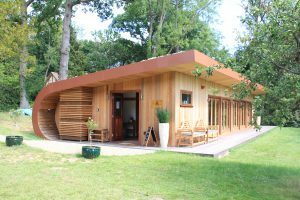 The living green or Sedum roof works in tandem with the beautiful cedar finish to blend the building into its natural setting and still be cool and contemporary. 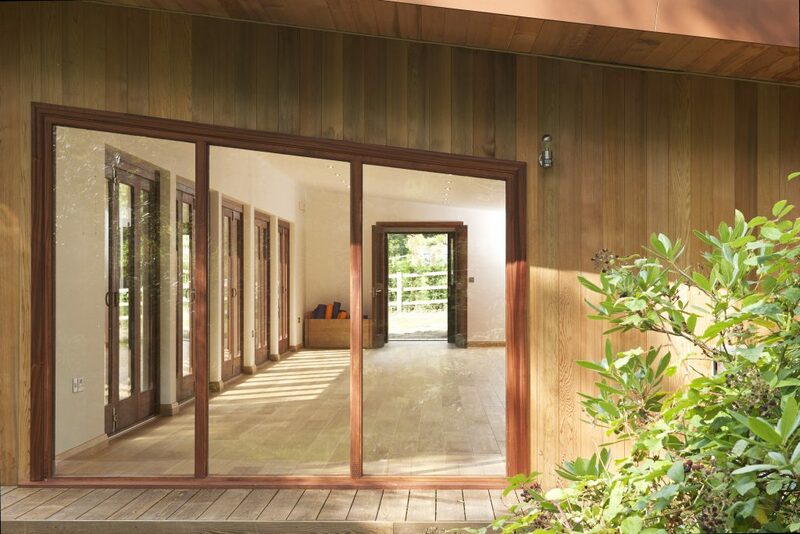 The Sp8ce Yoga Studio features several sets of large sliding doors that run along the entire front elevation of the building letting in natural light. 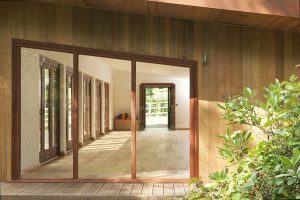 On a summer’s day these can be opened fully so that visitors can feel the natural breeze as they exercise or meditate. A large verandah surrounds the structure on three sides. This deck is finished with a unique timber called Kebony which is a wonderful sustainable alternative to tropical hardwoods. Its environmental capabilities and strength make Kebony the perfect material in this setting. The verandah and large windows are intended to maximize the relationship between the inside space and the outdoor setting and creates a seamless affinity between them. The studio’s interiors are clad with a combination of cedar lining and painted plaster. The curved rear wall creates a focal point that softens the shape of the room. This gives a light, spacious and airy effect that compliments the space’s use perfectly. The natural light and ventilation in addition to spectacular views across the garden and nearby lake amplify the tranquility already emanating from the space. Yet despite its airiness, this open and peaceful place is remarkably efficient. 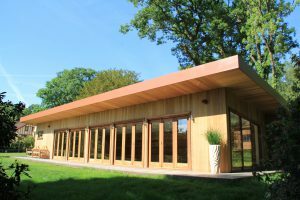 The design fuses excellent air-tightness with high standards of insulation, a large overhanging soffit (to reduce solar gain) and low energy fittings all reduce the building’s energy requirements. 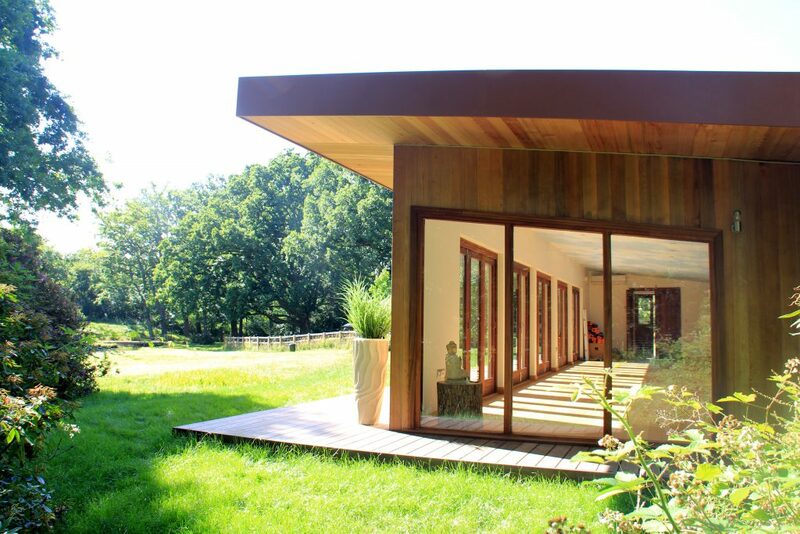 This studio’s design is a harmonious coalescence of efficiency, sustainability and serenity. 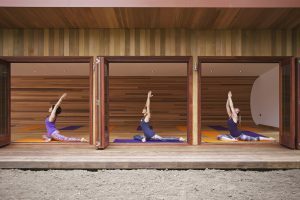 It’s the ideal destination for anyone’s yoga journey. 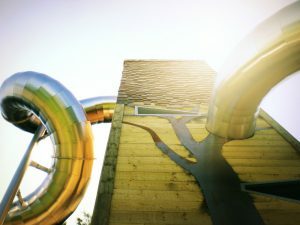 A fun playground set in a popular family leisure park featuring raised platforms connected by rope bridges, a beautiful treehouse den, slide and climbing wall.